New site achieves integration with Sage 100 ERP, Sage Payment Systems and Hubspot marketing software. Website Pipeline, a Greenville, SC web-development firm, has launched another successful e-commerce site that not only syncs with the client’s ERP and payment services, but with the marketing software as well. 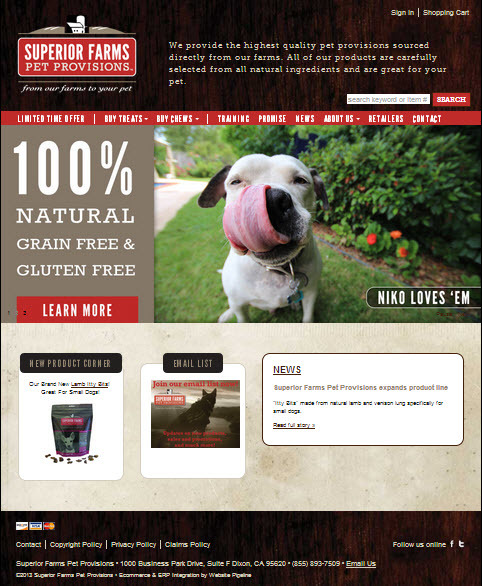 Superior Farms Pet Provisions, an all-natural pet treats company, came to Website Pipeline with a very specific list of criteria. They required e-commerce functionality that integrated with their Sage 100 ERP, Sage Payment Services and Hubspot marketing software systems. They also needed to easily add and remove content and products in a simple CMS. Eric Linden, Superior Farms E-Commerce Sales and Marketing Manager, affirmed “We wanted simplicity and ease of use for swapping products and content in and out of the website, and Website Pipeline has been great in this respect. It allows us to focus on selling and less on coding.” Website Pipeline begins every relationship by understanding the needs and goals of the business and devising a plan to meet these goals. “We also needed a platform that integrated with our Sage100 system seamlessly and Website Pipeline has been that platform,” stated Linden. ERP e-commerce integration is Website Pipeline’s specialty and is what brought Superior Farms to them in the first place. ERP integration means both the enterprise resource software and the e-commerce website share real time inventory levels and product information. This saves time and money by reducing errors and better utilizing employees’ time while simultaneously providing up-to-date inventory on the website 24 hours a day. Sage Payment Services, Superior Farms’ payment solution, provides a full line of payment-processing products designed to work with the ERP software. Website Pipeline uses a system of functional modules as a cost-effective means to building sites, and this system accommodates real-time authorization and passes encrypted information to the ERP using Sage Payment Services. Superior Farms Pet Provisions produces all-natural pet treats and chews sourced from their own USDA-approved farms. They believe proper nutrition provides superior health and wellbeing to people and pets alike. The all-natural products are made in the USA and contain no artificial colors, flavors, or fillers and are grain and gluten free. To find out more about Superior Farms Pet Provisions visit their website www.superiorfarmspet.com. Website Pipeline designs, builds, hosts and supports ecommerce websites featuring real-time, bi-directional integrations with popular ERP systems for both B2B and B2C product-based businesses. To learn more about the company visit www.websitepipeline.com.